THE CHEDI CLUB Tanah Gajah by GHM Hotels in Ubud, Bali – Indonesia is one of The Leading Hotels of The World and after personally staying here I now know why. THE CHEDI CLUB Tanah Gajah by GHM Hotels is located just outside the artists’ village of Ubud, on a former private estate of Hendra Hadiprana – one of Indonesia’s most respected art collectors – who transformed five hectares into a intimate luxury resort with twenty individual villas, each featuring unique and original Balinese artworks from his collection. From the moment I walked through the front entrance door, I could feel the love, peace, privacy – serenity at THE CHEDI CLUB Tanah Gajah by GHM Hotels. It had such an inspiring uplifting feel good energy that I truly loved. 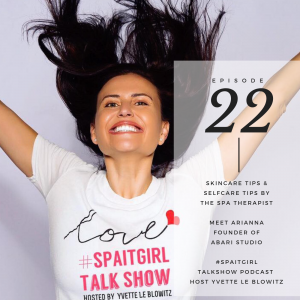 If you click on my below play button you can watch the Spa it Girl – Travel Show on IGTV as I take you in with me. THE CHEDI CLUB Tanah Gajah is nestled amongst the rice paddy fields and when you look around will find so much beauty in everything from the lotus ponds, black and white swans, trees, flowers, plants, bushes, scrubs, art statutes, nicely separated private villas, if you are lucky like I was even little ducks wondering in the water ponds. I loved how I could see art collections in places like the main reception and really at every main seating area. I also loved how every guest was so respectful and staff included of everyone’s privacy and space too – as there are only 20 private villas here too I felt at times I was actually the only one on the five hectare property however I was clearly not but when I was walking around the Luxury Hotel and also in my private pool villa it truly felt like I was. If you love to practice yoga like me you will be happy to know they offer a open air yoga pavilion. One of the things I really loved about staying here apart from knowing they had a SPA, a Hot Airballon, only 20 private pool villas, was how they had a very large open air restaurant that overlooked the rice paddies and also the spot for the Hot Airballon take off. I don’t think I have ever been this excited to feature and cover a Luxury Spa Travel story like this. It’s not every day that you get to stay at a Luxury Spa Travel Hotel like THE CHEDI CLUB in UBUD Bali that offers not only luxury private pool villa accommodation with your very own private butler, plus the opportunity to go up in a Colourful Hot Airballon over looking the gorgeous rice paddies and the UBUD surroundings followed by a SPA visit and Spa Treatment that over looks the rice paddy fields also. I was seriously in SPA IT GIRL – LUXURY SPA TRAVEL heaven. Whilst staying at THE CHEDI CLUB I really felt that it had a warm Balinese feel and I loved how the buildings and all settings blended in naturally with the mother earth setting. The energy flow of THE CHEDI CLUB was free flowing and I loved how it had this really feel good, uplifting and inspiring positive relaxing energy that went with it. Seeing the Hot Air Ballon get prepared to take guests up was also next level amazing as it’s not every day you get to experience something so unique like this and THE CHEDI CLUB is the only place in BALI that has it’s very own Hot Air ballon which is used to take you up so you can have views not only over THE CHEDI CLUB but also afar. You can expect if you have your afternoon tea down at the main restaurant or a cocktail drink to be able to view this exciting luxury travel experience available only at THE CHEDI CLUB in Ubud, Bali. THE CHEDI CLUB also has it’s very own amphitheatre and they host one of Bali’s most dramatic performances only for their very special guests, the Kecak dance was amazing to watch and I loved how afterwards we got to get a photo with the performers of the Kecak dance plus how we all got to go to the Restaurant to experience a traditional balinese royal dinner which was totally amazing too. It was such a soulful spa experience and also is now one of my all time favourite SPA experiences. The Spa Treatment room was in a beautiful wooden warm style room that opened up to a gorgeous back patio wooden decking that had a big sunken square bath tub along with two chairs a round table in between and a foot bowl and beautiful spa products that awaited me along with the choice of my tea and water. The Spa Music was softly playing and spot on, the presentation of the spa treatment room was amazing and ticked every cleanliness quality high box. The spa treatment room I was in and the spa overlooks the peaceful and calming green lush rice paddy fields. Being immersed in this beautiful spa setting made me feel so at peace from within and just looking out to this view was so calming too. For my Spa Treatment I had an Ancient Balinese Massage, the traditional Balinese-Style massage including a Balinese palming, stretching along with massaging of my effleurage and the use of the pressure point technique that was great for relieving tension and improving blood flow and easing stress and calming the mind. My Spa Therapist was Mila and she was actually from UBUD and a local spa therapist which I loved finding out also. Mila was so attentive, highly professional and made me feel at total ease and comfortable. Her spa massage technique was delivered to the highest 5* standard and as a result when I received the Ancient Balinese Massage thanks to her I was able to switch off my busy go-getter let’s do it mind and she was able to send me into one of the deepeset states of pure relaxation which I absolutely loved and really needed – yes even as the founder of a Luxury Spa Travel website. My spa experience was truly a magical awe inspiring experience thanks to not only Mila and her wonderful professional high quality spa therapy skills but also because the spa treatment room was suited right amongst the rice paddy fields, listening to the elements of mother nature and also the combination of the soft spa music with the flow of the ancient Bailinese Massage was so soothing for my body, mind and soul. One it comes to a Luxury Spa Travel experience this will be one spa treatment and setting I will never forget and this is one Luxury Spa Travel Destinations I will be raving on for many years, decades to come and I hope you read my public statement also for many SPA Generations to come. It’s not every day you get to wake up on sunrise and go up in a Hot Air ballon in Bali and then visit the SPA too. What a one of a kind unique luxury spa travel experience and one I truly hope you get to experience for yourself also. When you walk around The Chedi Club it will uplift your heart, body, mind and soul it is so breathtaking watching the sunrise over theMount Agung – Bali’s highest and holiest mountain especially when you go up in their dedicated Hot AirBallon which is the first and only Hot Airballon experience in Bali that goes up 50 metres in the Air so you can overlook The Chedi Club and beautiful natural surroundings also. The dinning experience at THE CHEDI CLUB Tanah Gajah by GHM Hotels was marvellous and so feel good every single time. I loved my Breakfast, Lunch, afternoon tea which was nicely presented on a tier of plates which gave it that very special High Tea feel. I loved how you could choose to have your afternoon tea anywhere you pleased. When it came to Cocktail Hour it was lovely how you got to choose what Cocktail you wanted to try and then your private butler (Nick) in my case would bring that up to my private pool villa and I would enjoy that along with some lovely nibbles overlooking my gorgeous pool immersing myself in the sheer beauty of mother nature at THE CHEDI CLUB Tanah Gajah by GHM Hotels. Every day that I woke up at THE CHEDI CLUB Tanah Gajah by GHM Hotels was a beautiful feel good day & night. I had no desire to even want to leave because that was how amazing it truly was – plus their whole daily food and beverage dining offerings is a travel experience in it self. The Chedi Club has this amazing big open air Restaurant pavilion that over look’s the rice field and because of this it truly provides a one of a kind dining experience. It was so peaceful and relaxing just sitting at the table connecting with all of the elements of mother earth and I truly felt so grateful when I saw the local farmer a women attending to her rice paddies crop and I was so grateful for being the girl sitting in the chair over looking her hard work as I know all to well how hard farming on the land can truly be. One of the things that I really loved most that day was when I SMILED at the RICE Farmer and she SMILED back – it was in the moment I was so grateful to be kind at heart and to pay respect to others that some people might not. I have truly believed that a job status does not define us and I have always had such respect for any women who is a house keeper, a farmer you name it – it’s not the job title, nor the social status of how many followers or likes that defines someone it is how kind they truly are in REAL Life. Some other things I loved about THE CHEDI CLUB was their main swimming pool too and it was so relaxing spending time on the lovely day bed and once again I was greeted by another amazing staff member who instantly offered me a welcome drink. I also loved strolling and walking around the THE CHEDI CLUB as it had such a feel good energy and every where I looked it made me feel good. Meeting the SPA Manager and staff of course. Hanging out with BIMA and the GM and the rest of the staff too I really loved how lovely every one made me feel. I stayed in a Private Pool Villa and it was so lovely indeed – I had the best night’s sleep every time it was so peaceful and private, I absolutely loved having my own private sunken outdoor bath also I had the pleasure of a Mini Bar that was stocked and full, along with room service and my private butler literally at my beck and call. My private pool villa suite and room was so lovely with gorgeous art work, wooden furniture it had a beautiful timeliness balinese holiday feel to remember. The energy in my villa was so warm, inviting, safe and I think even if you travel solo or with a partner or loved one regardless it is a beautiful space to relax in both in side our outside poolside. My private butler was Nick and he was absolutely brilliant – he had the biggest happiest smile and vibe and nothing I wanted was a problem and even as a media kind of go getter girl he was always happy to help. I instantly felt like on an inspiring energy uplifting high being in his presence. I truly believe that it’s the staff that can make or break any travel holiday vacation experience. But if you want to be looked after and love to be waited on hand and foot with a happy smile and with utter happiness and grace then you will love staying at THE CHEDI CLUB – it’s the quality service also thanks to their staff that truly make this place what it is today. The staff at THE CHEDI CLUB were all amazing and they all had fantastic hospitality skills they were all so happy and big smiles and positive energy clearly showed they all loved working there. This place truly had so much heart and soul – a story – it wasn’t just a big hotel built by some big developer or a place that had hundreds of people working for it and because it was so unique, and created with so much heart and soul this vibe just simply continues to grow and grow. Would I recommend staying at THE CHEDI CLUB Tanah Gajah in UBUD – YES – it’s one Luxury Spa Travel Experience I WILL NEVER FORGET – it was an UNFORGETTABLE experience. 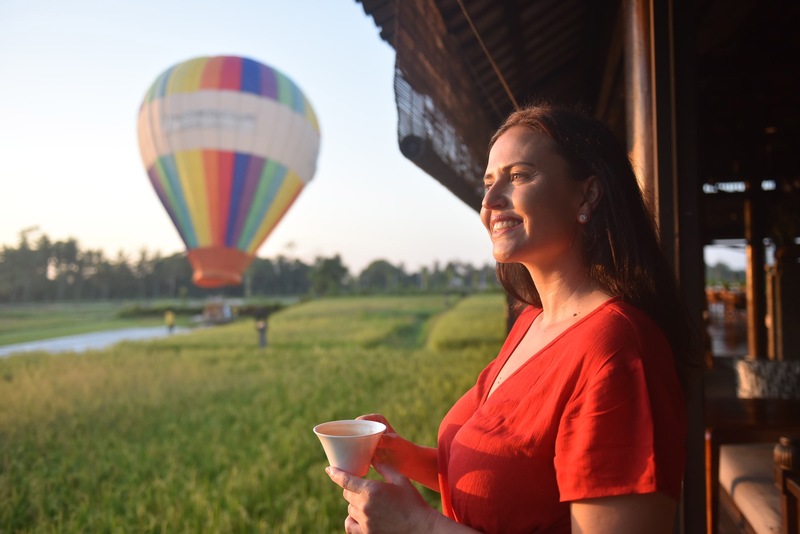 Would I recommend going up in the HOT AIR BALLON to look over The CHEDI CLUB, rice paddies and hills afar YES – it was absolutely AMAZING amazing and lots of fun going up in the Hot Air Ballon. I loved the feeling the fresh air and the sun beams on my skin looking over THE CHEDI CLUB approximately 50 metres above the ground was the best way to get a much better perspective on this gorgeous Luxury Spa Hotel plus the UBUD surrounding area also I loved looking out across the hills, mountains, farm land. 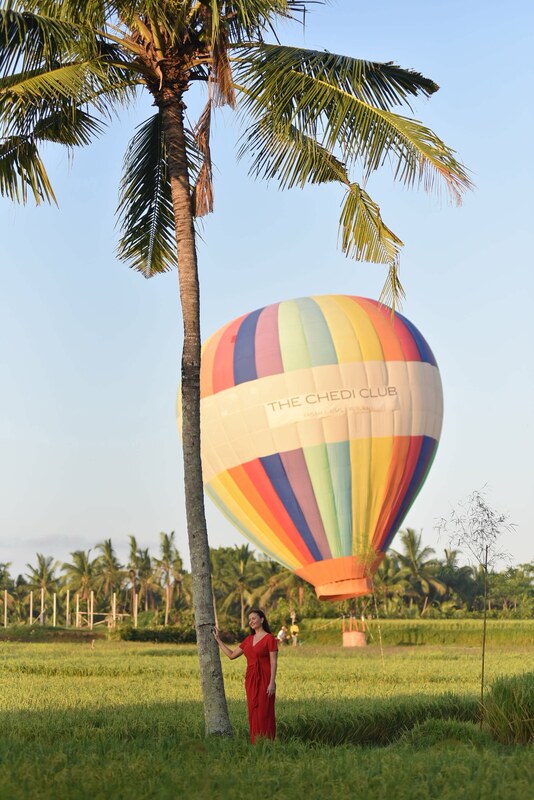 The Hot Airballon is held down with ropes by staff – so whilst you don’t actually FLY off as such like you do in Australia – you can’t beat waking up on Sunrise to do this when in Bali and staying at THE CHEDI CLUB. Did I love my spa experience at THE SPA at THE CHEDI CLUB – YES YES YES – it was a spa day I will never forget both thanks to the gorgeous Spa Setting and my Spa Therapist Mila too. Do I plan on going back and staying at THE CHEDI CLUB Tanah Gajah in UBUD – YES! A very big thanks to all of the staff at THE CHEDI CLUB Tanah Gajah in UBUD – YOU ARE ONE OF A KIND and UNFORGETTABLE – thanks for making stay one of the most memorable one’s. Hashtag #spaitgirl or #spaitboy to share your own inspiration by using our hashtag/s too.